Time to get excited because you are about to take the Healthy Attitude Test and learn how to create supportive thoughts and beliefs that will improve your health instantly. Okay, let’s keep this quick and simple, otherwise this topic deserves multiple books to talk about it. There are many different attitudes we could talk about, like attitude towards yourself and others, or attitude towards your job and life in general. But we will save those for another time and focus on why you are here, which is your attitude associated with HEALTH. You could be doing everything right (or so you think) for your health. Eating right, exercising, resting, but…because you have a glitch in your attitude that affects your well being, your health suffers. It may suffer so much from this one component that all of the rest can’t help you lose weight, feel great or fight off illness. That’s how powerful this component, attitude, is. The goal is to balance all components of health (find them here) so that your health is HOLISTIC and comes from your mind, body and spirit. Each one has its own energy that nourishes and completes the body. Good nutrition is great, but doesn’t go very far if you are full of hate, judgement and resentment. Everything is energy. If you can’t let go of mental baggage, is it very hard for the body to let go of physical baggage (weight). Here’s the kicker – these thoughts are NOT YOU. They were planted there at some point in your life by someone ELSE, like T.V., school, friends, parents, newspaper, etc., and now they are stuck in your head floating around for you to call your own. We have probably all been called stupid, fat, ugly, skinny, or whatever at one point in time, and unfortunately, some of us still believe it 10-90 years later. This is where affirmations and practicing new thoughts come to the rescue. These are simple and proven ways to change your habits, thoughts, beliefs and actions, and all you have to do is spend a few minutes each day on them. Below in the Healthy Attitude Test you will find questions that expose some of these deeply rooted thoughts and beliefs that stop you from reaching your potential. Once you figure out these “weeds”, you can build a program for yourself that involves changing weeds into seeds that will actually HELP YOU GROW beyond your current state and potential. It is like super-injecting you with positive thoughts and energy. These techniques have been around for many years and are the most effective behavior change strategies ever known for self use. Ever wonder why you or others dislike or make fun of healthy people? Or why you think health food is for rabbits and “real” food is for “real” people? Trust me, the body does not think like this when you start out in this world. It was trained to think like that, and it can and should be untrained, otherwise health is unachievable in the mind because it sees health or healthy people as undesirable. Many people think, act, eat and cook just like their parents, not even considering the fact that eating fried foods makes them lethargic and congested and that judging people only feeds their insecurities. The great news is that you have a choice, and with a little help, you can learn a method for finally achieving your goals. We must train the brain to be healthy or whatever the goal may be. That is where this program comes in and identifies and pulls weeds (unsupportive beliefs) and plants new and supportive seeds (beliefs). Rate yourself from 1-10 for each of the following statements. ___ I exercise too much/not enough/inconsistently/not at all because ________________. ___ I don’t enjoy my health. ___ My health is not very important to me. ___ Exercising will not improve my health. ___ Proper nutrition is not very important to me. ___ Proper nutrition will not improve my health. ___ Exercise will take time away from more important things, such as __________________________. ___ I dislike healthy and good looking people. ___ I doubt that I can achieve health because my past is so unhealthy. ___ Becoming healthy is too much work. ___ If I become healthy, certain people will disapprove of me. ___ Being healthy and looking good is mostly for self-centered people. ___ Most healthy people aren’t truly happy because they always have to eat or act healthy. ___ It’s easier to be unhealthy than healthy. ___ I’m not smart enough to be healthy and successful. ___ I’m not good enough to be healthy and successful. ___ I will feel like a failure if I try to achieve health and don’t succeed. ___ I don’t really want to be healthy. ___ ________________________________________ is more important than my health. ___ I don’t enjoy the habits and ritual (lifestyle) of healthy people. ___ I’m too unhealthy right now to ever become healthy. ___ Trying to achieve health is stressful. ___ It’s too expensive to be healthy. ___ I wish I didn’t have to think about being healthy. ___ I don’t have time to eat healthy. ___ I’m too busy to take time and learn about becoming healthy. ___ I resent some people because they are healthy and successful. ___ People’s opinions of me influence my health habits. ___ I’m already satisfied with my health. ___ I don’t need help from others to achieve health. ___ Once I eat and exercise appropriately I will be healthy. ___ I will finally prove myself once I am healthy and successful. ___ Being healthy is not a skill I can learn. ___ I don’t want to be called one of those “healthy” people. ___ Health is not for me. ___ I can’t eat healthy. ___ Most of my friends or family are unhealthy so it is easier for me to be unhealthy like them. ___ There is too much to learn in order to be healthy. ___ I don’t want to change my lifestyle to become healthy. ___ My main coping mechanism for stress is exercise. ___ Being healthy doesn’t matter. I know people with cancer or who have died and they were healthy. ___ My theory is this; as long as I am happy, I am healthy. ___ Healthy people are just too weird. 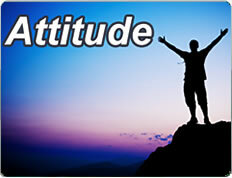 Choose at least three statements from the Healthy Attitude Test of which your score surprised you or were the highest. These three statements and their opposite supportive statements below (seeds) will be the focus of your “attitude change” and can be the most powerful ally in your journey to health. There are a few ways to do this, below is one way. If you would like some more advanced ways then please contact me and we can set up a coaching session to help you figure out the best methods for your unique situation. Every morning and night, take a few moments to repeat aloud your seeds, one at a time for at least 10 times each. These are like affirmations, but they are specifically tailored for you. I know it may seem silly to repeat these, but think about it, you are already repeating things (subconsciously or consciously) on a daily basis that do NOT support what you are trying to become. Might as well repeat some stuff that will help you. Whenever you hear yourself think or say one of your weed phrases during the day, instantly overturn it by saying to yourself “thanks for sharing” and then repeating or thinking the associated seed phrase. This may happen many times per day, so stay aware of your thoughts and your words so that you can start to make an impact on that subconscious powerhouse of non-supportive thoughts. Below are some healthy affirmations that are helpful to repeat and also pretty fun. I control my health so that it won’t control me. I don’t have to wait to be healthy, I can be healthy right now. My body is my vehicle in which I can express my true self. My body is my home sweet home. I am committed to my health every day. I have a healthy body, mind, and spirit. My future depends on me right now. My health is a symptom of my past beliefs and habits and can be improved by embracing new and supportive ways of being right now. My physical health is a result of my mental, emotional, and spiritual well being. The only way to improve myself is by overcoming adversity. If I am comfortable I am not growing. There are no such things as problems, only challenges, and I’m up for any challenge. The only way to coast through life is downhill. I am willing to do what is hard in order to make life easy. What I give, I get. What I think, I become. What I do, I am. What I focus on, becomes my reality. I enjoy being around and surrounding myself with other healthy and supportive people. I admire and compliment healthy people so that I too will become healthy. I lead by example for unhealthy people without trying to change anyone. Obstacles are what I see when I lose sight of my goals. I choose to create new and supportive beliefs that will support a healthy lifestyle. Worrying is like praying for things I don’t want. I am grateful for the health I have right now. If I lose sight of my goals it’s because I’m listening to the same voices in my head that have gotten me exactly where I am right now. If I let things clutter up in house, car, and environment, I let things clutter up in my mind and body. I am accountable for everything that comes out of my mouth. My word is never broken! I always stand in my power and speak my truth…… with compassion. I follow my heart no matter what the voices in my head say. A formidable share, I simply given this onto a colleague who was doing slightly evaluation on this. And he in truth bought me breakfast as a result of I found it for him.. smile. So let me reword that: Thnx for the deal with! However yeah Thnkx for spending the time to discuss this, I really feel strongly about it and love reading more on this topic. If attainable, as you grow to be expertise, would you thoughts updating your blog with extra particulars? It’s extremely useful for me. Huge thumb up for this blog publish! Thanks! I will certainly be updating all content that I continue to learn.